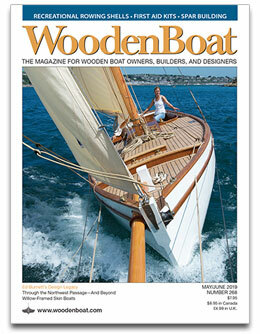 WoodenBoat contributor Bruce Halabisky and his young family have been cruising in a 34′ wooden boat for the past seven years. Most recently the family crossed the Atlantic from Maine, via the Azores, and then sailed on to Senegal. Since March this year, they’ve been in the Caribbean. In this special blog post, Bruce discusses the joys and challenges of extended cruising with young children aboard. —Eds. When my wife, Tiffany, and I had our first child in New Zealand after two years of voyaging in our Atkin gaff cutter from the west coast of Canada, we were warned by other parents that our footloose voyaging lifestyle was about to come to an end. They cited safety concerns and the logistical difficulty of a child living in the small space of a 34′ sailboat. In retrospect, while I appreciated the concern and valued the advice of those who warned us of the difficulties, I wish more parents would have told me about the amount of fun that can be had sailing with children. Seven years after ignoring these warnings, we now have two daughters onboard—seven-year-old Solianna, and three-year-old Seffa Jane, and our wooden boat, VIXEN, has continued sailing around the world. We’ve crossed the Indian Ocean once and sailed twice across the Atlantic. It is true that there are challenges: Safety and health are always concerns, and each age demands new approaches to the intricacies of life aboard. However, to be able to visit foreign lands and live in direct contact with the natural world with your children by your side is a rich experience, an experience more often than not filled with laughter and worth the difficulty and danger of going to sea with children. The challenge for parents voyaging with children is keeping them safe while allowing them to explore all that life on the water has to offer. Falling overboard is an ever-present danger—one mitigated by parental awareness and the use of the appropriate safety gear. One advantage on a boat of VIXEN’s size is that, compared to most homes on land, the living space is small enough that it is rare not to be able to see where all of the family is with a single glance. On VIXEN I have mentally divided the boat into three distinct zones with varying levels of safety gear and parental supervision necessary for each: the deck, the cockpit, and the interior. A boat’s deck can change from being a relatively benign environment—say, at anchor in a quiet cove—to a place where even an adult would be at risk—for example, beating to windward in heavy weather. For this reason our kids remain in the cockpit or the interior when the boat is underway and don’t venture on deck except in unusual circumstances such as watching dolphins playing off the bow wake. Lining the perimeter of the boat with fishing net gives an extra line of defense for keeping kids from falling in the water. At anchor or in a marina, life jackets are worn on deck unless I am able to give 100-percent supervision. A good life jacket is the most obvious and essential piece of safety gear for boating with children, and care should be taken to find one that fits properly and is attractive to the child. A classic orange horseshoe stuck around a kid’s neck may work for a day trip but is sure to become a hated piece of equipment on any longer voyages. It is important that the child is comfortable not only standing up but also sitting down—a requirement that many jackets fail to provide for smaller children. Tiffany and I have had some luck using the pseudonym of “swim jacket” rather than “life jacket” and have, indeed, taken the girls swimming in their jackets. I remember being surprised at how a special patch or picture of a mermaid was enough to lend a sense of fun to this piece of safety gear. For younger children a life jacket should float them face up, have a strap between their legs, and a good handle behind the neck. Our girls spend a lot of time in the cockpit. With a basket of beach toys and a bucketful of water they will play for hours, even while we are sailing. The obvious dangers are the tiller (or wheel), sheets, and engine controls. Falling overboard is still a concern, but the buffer of the cockpit coaming, the deck, and the netted lifelines offer a degree of protection. With children who are just learning to walk we have used a homemade safety harness made of webbing similar to the one I use on deck for offshore sailing. With a line attached to the harness, it allows the toddler a certain amount of freedom while maintaining a physical connection to the parent. Another safety concern in the cockpit is exposure to the sun. Even when under sail, we rig some kind of sunshade and use sunblock and hats when appropriate. In rough weather our girls leave the cockpit and head down to the heart of VIXEN: the interior. Once the children are down the companionway steps, there is no danger of falling overboard and life jackets are not worn. We have two settee berths port and starboard—a classic layout—which are where our children retreat to when we can’t keep an eye on them because of something that demands all of our attention on deck. These berths have large lee cloths with clips overhead and that create a safe enclosed area about 2′ x 8′ which they can’t roll out of; they also can’t be struck by anything thrown around the cabin. I like the idea of mesh lee cloths in the heat of the tropics, but we’ve stuck with solid fabric for privacy and to create a dark corner for sleeping during the day. On a wooden boat it is amazing how quiet and peaceful it can be behind the lee cloths while a gale is raging up on deck. In this protected area children can have their stuffed animals, books, and games. Other dangers in the interior are the stove, and things falling while the boat is underway. We have a blanket that protects the hot front of the oven and locking cabinets to keep things from falling out. Many boat interiors are more “kid-friendly” than homes on land just because everything must be able to be locked down while at sea. If the oven is on while sailing, then either Tiffany or I keep a full-time lookout to make sure no one gets burned. There is one small cupboard in VIXEN for plastic containers which the girls have claimed as their own and accordingly pack and unpack many times during a voyage. I have yet to have an adult visitor aboard VIXEN go immediately to sit under the galley table or crawl into the forepeak where the headroom is less than 3′, but this is what visiting kids regularly do. Children find security in small spaces that adults would normally balk at. There is also an unchanging quality to the inside of a boat that kids like; here are their toys and books, a world of familiarity to assuage whatever chaos may be transpiring on deck. Aside from keeping children from falling overboard, there are other challenges of boating with children. We are often asked if our kids get bored at sea. They don’t. Maybe this is because they have been on the boat since birth or maybe they just aren’t old enough yet. If we’d had two boys instead of two girls, it’s possible, judging from the exuberance I’ve seen in some young boys, that we would have moved ashore long ago. This is a big one, especially since we carry only enough fresh water for drinking on our little boat and have no watermaker. Our longest passage on the ocean without touching land was from Honolulu to French Polynesia, which took 31 days. Fortunately, this leg was pre-children. Our longest nonstop trip with children in diapers was from Sumatra to Chagos in the middle of the Indian Ocean. We don’t use disposable diapers, mainly because after 15 days at sea we would have garbage bags full of dirty ones—not much fun on a small boat. So for better or worse, we used cloth diapers. At sea dirty diapers get towed astern for an hour or so and then dried on deck. Despite being clean, they were only reused in an emergency because of the salt in the cloth. The other diaper solution is no diapers, which works pretty well in the cockpit and on deck, but for obvious reasons is less desirable down below. Fortunately, both of our girls are now out of diapers; draping VIXEN bow-to-stern in drying nappies is just a fading memory. Before having kids, Tiffany and I had settled into a three- or four-hour watch system during the night and a more casual routine during the day. With a baby aboard, this same system actually works pretty well since the baby is awake every three or four hours anyhow. Seffa Jane and Solianna sleep well at sea and typically arrive at our landfall more rested than their parents. What seems to work best is having Tiffany go to sleep with both girls while I stay awake for as long as I can—usually until about 1 a.m. Then Tiffany will take a four-hour watch and I will be on again from five until eight in the morning. I make up for the long night by sleeping as much as possible during the day. If the girls are restless or the weather rough, this fragile system falls apart and, like many parents who aren’t at sea, we get very little sleep. That said, both Tiffany and I look forward to night watches. On a small boat it is one of the few times when you have a moment alone—time to sit in the cockpit and quietly watch the stars or listen to music. Our sailing route around the world passed through some of the highest-risk malarial zones on the planet. Even worse, we were moving so slowly that it would have been dangerous for our kids to take prophylactic drugs for the years and years it took to transit these areas. Another concern, in some areas of the world, was making sure our kids got clean food and water. With all of these health worries, our boat plays an important role in protecting our children. If we had lived ashore in malarial zones for such a long time, I’m sure at least one of us would have been infected. By anchoring well offshore, returning to the boat before dusk, and being serious about putting up mosquito nets we hardly, if ever, got bitten, and more important never got sick. Good food and water were also provided by the boat; in risky areas we could fall back on our food stores and filter any questionable local water. The fact that Tiffany nursed Solianna until she was three years old added another layer of protection. When we weren’t at sea, much of our time over the past nine years has been spent visiting islands, which is inevitable when crossing oceans by boat. Many of the communities on these islands have at their social core a strong family unit. The family, and it may extend to aunts and uncles and beyond, is seldom apart. To arrive by yacht as a couple with no children or, even worse, singlehanded, is difficult for these tight-knit communities to comprehend. “Where is your family?” we were often asked when we visited the islands of Fiji before Solianna was born. When my father joined us in Vanuatu, the first question he was asked in the villages was, “Where is your wife?” Even when he explained that he was happily married and his wife was waiting for him at home, an air of suspicion lingered. Although the islanders we met while voyaging before we had children were certainly kind to us, there was a noticeable shift in relations when we rowed ashore with a baby. Now, instead of being greeted on the beach we were ushered without question into a nearby home. Tea was served. Mothers from neighboring houses came over to see what was going on. Tiffany would nurse Solianna or change her diaper. Mothers would nod approvingly; they were often doing the same for their children. Even if we didn’t speak the language, by arriving as a family there was a basic understanding on which to start a friendship. Yes, we came from an incomprehensible culture on a boat containing unimaginable wealth, but because there were children with us our strange ways were at least initially overlooked. It wasn’t only islanders who went out of their way to help our family on our voyage; customs and immigration officials also seem to go easy on traveling families. In Australia, where officials carry a big stick and are rightfully feared, we couldn’t get them off VIXEN—not because they were searching for drugs, but because they were cooing over the cute baby. Many of the joys and perils of ocean voyaging in a small boat come from living in close contact with the natural world. To see a massive humpback whale breach alongside VIXEN is an awe-inspiring sight. To see that awe reflected in Solianna’s and, increasingly, Seffa Jane’s expressions is doubly inspiring. Voyaging with children means that you are out in nature with your kids. We are not the first parents to recognize the lessons of power, respect, and humility that nature teaches. In South Africa we visited, several times, the Umfolozi game park with Solianna who was three at the time. From our rental car she saw black rhinos, giraffes, and warthogs. The three of us nervously waited for a herd of wild elephants to graze their way past us while Solianna showed her favorite doll, “Norma,” the action from the open car window. In Madagascar we saw lemurs, chameleons, and baobab trees; in Indonesia, Komodo dragons; and in Borneo, orangutans. There is also the natural beauty of the oceans—the whales and dolphins that regularly interact with VIXEN or the catching of a large tuna on our trailing fishing line. Once I was with Solianna in the cockpit on a dark night when a dolphin shot under the boat leaving a trail of bioluminescence like some kind of shimmering ghost lingering in its wake. There have been frightening times too. At the mention of lightning, Solianna, Tiffany, and I look at each other and remember a humbling night off Sandy Hook within sight of New York City; we got caught in a storm of such intense crackling explosions of lightning it was a wonder we were not struck. Ocean voyaging with children is not for everyone. I imagine it is especially hard for kids who are accustomed to life on land or kids who easily get seasick to adapt to life on the sea. There certainly are times of worry and fear. And being away from the support system of extended family can be trying. I won’t pretend that there are not times when the girls are both crying, Tiffany’s got a headache, and I’m fretting about whether I should reef the mainsail ahead of an approaching squall. However, if the safety issues are addressed thoughtfully and the boat is well found, the opportunity to visit remote and different cultures and to live day-to-day in the natural world with your kids is, more often than not, a wonderful experience. One morning when Solianna was two years old, she noticed some dried clumps of mud on deck. They were made of black, sticky goop dredged up from the seafloor by our anchor chain and had a satisfying sun-dried crust that allowed them to be picked up and rolled between one’s fingers. With the uninhibited glee of a two-year-old, Solianna threw the clumps one-by-one into the ocean and giggled at each kerplop as they hit the water. The next morning we got underway before Solianna was awake. I brought up the anchor and was about to bucket-wash the foredeck. Before releasing the water, I noticed some perfect clumps of mud. I shyly looked back to make sure that Tiffany wasn’t watching and then carefully put aside a few of the choice bits while thinking about how Solianna would enjoy throwing them overboard later when she woke up. It made me laugh just thinking about it. And then I realized, as I scooted little mud balls into the scuppers, that aside from all the cultural and educational experiences, it was the little everyday things, the things that would have gone unnoticed or even been a nuisance had we been without kids, that were, perhaps, the main reasons to go sailing and crossing oceans with children.